Climate change activists glued themselves to a train and others chained themselves to Jeremy Corbyn's home in a third day of protests. Four people also glued themselves together at the Labour leader's home. The activists, who also used a bike lock to attach themselves to Mr Corbyn's north London house, said they supported him but wanted the Labour Party to go further than declaring a "climate emergency". After ending their protest Tracee Williams, one of the group, said she did not think the action was a "misstep but whether we'd do it again, I'm not so sure". Easter eggs and flowers from the group, which had been taken into Mr Corbyn's home earlier, were later returned to the street by the Labour leader's wife Laura Alvarez. Ms Williams added the group "really felt we had to bring it to his front door" but "feel absolutely terrible about upsetting his wife". 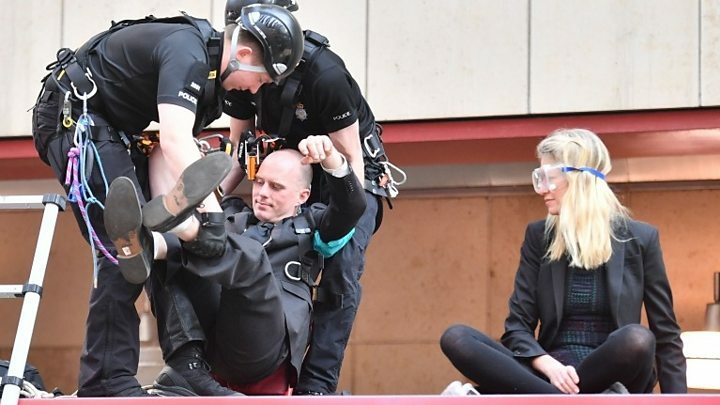 The man and a woman who unfurled a banner and glued themselves to the top of the train's carriage were also later removed and carried off by officers. Supt Matt Allingham said extra officers would be on duty throughout the day, adding: "We will not tolerate any activity which disrupts the millions of passengers who rely on using the rail network in London." The Metropolitan Police says it uses a "fluid de-bonding agent" - but refuses to specify what that contains for operational reasons. Dr Mark Elliott, a senior lecturer in organic chemistry at Cardiff University, said warm, soapy water or the compound acetone would be the most suitable method - but warned any removal was likely to be painful. "Anyone who has inadvertently stuck their fingers together with superglue will know how difficult and painful it can be to separate then - and the fingertips are relatively tough," he says. "It is even more painful when other, softer, areas of skin become bonded." According to Dr Elliott, the general advice is to use warm, soapy water, then to apply gentle pressure - for example by inserting a spatula. "This will inevitably take time and be rather painful," he warned. Alternatively, acetone - normally found in nail-varnish remover - can make it easier to remove the glue - but "easier", he adds, "is very much a relative term". The BBC's Dominic Casciani said about a dozen people were carried to police vans at Oxford Circus after failing to comply with police. Springwatch presenter Chris Packham, who was at the protest in Oxford Circus, said the atmosphere was "peaceful and resolute". The Met Police said "contingency plans are in place should custody suites become full". 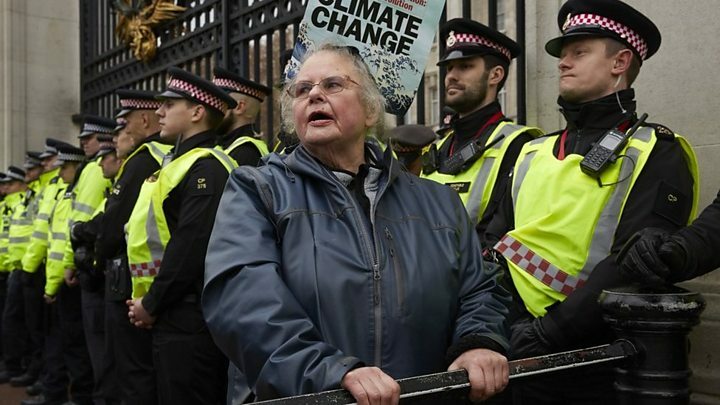 Extinction Rebellion earlier said "thousands" more people were willing to be arrested as part of the non-violent disruption. It had been planning to target London Underground to "highlight the emergency of ecological collapse" and persuade ministers to meet group members. The campaign group said: "Today we will disrupt one overground line as part of our escalating campaign to demand the government acts now on the climate and ecological emergency." London Mayor Sadiq Khan urged protesters to "think again", adding public transport helped tackle climate change. The 20-year-old said: "I have no issue with wanting to better the environment and we're fairly conscious of it as a family. "Their methods, however, are seriously flawed and are not inclusive of people who want to support the cause." Protester and climate lawyer Farhana Yamin, who was arrested on Tuesday, earlier told BBC Radio 4's Today programme: "I totally want to apologise to people using public transport. "But at the same time we need to take actions that are disruptive so everyone understands the dangers we're facing right now." He told BBC Radio London: "Everyone has a right to peaceful protest. But this is really disruptive." Environment Secretary Michael Gove said "it's appropriate for people to make their feelings known" but added: "We've got the message; we understand that action needs to be taken." Speaking on the BBC's The One Show, he said some of the protest action had been "over the top" but driven by a "legitimate desire to put climate change and the environment further up the agenda". Mr Gove said the UK had "played a role in reducing carbon emissions and at the same time growing the economy", but admitted "there is more to be done". A spokesman said: "We've asked our independent climate experts for advice on a net zero emissions target and set out plans to transition to low emission vehicles and significantly reduce pollution."